Well, for once I get to give a very positive update! 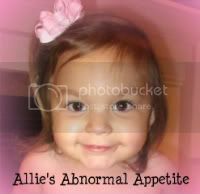 Allie is doing wonderful. After meeting with her Dietician, we switched up her formula and feeding schedule. She is now tolerating her feeds better than ever and we are getting slightly more calories into her. 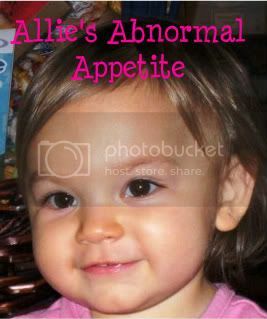 As stated in my previous post, we have switched Allie's formula to Pediasure Peptide (predigested formula). We are still adding Duocoal to it to add a little extra calories. Allie now receives all of her feeding via gravity bag. It works wonderful. The downside is Allie's feedings now take a half hour each time but that's okay. She's a calm little girl and doesn't mind sitting on the couch or her bed for a half hour. Allie gets 3 feedings during the day and each feeding is 4 oz. At night, she gets 6 oz over an hour period. Of course she still isn't getting the full calories she needs but we are working on it. In addition, Allie is still eating a little bit orally. It continues to go in spurts but we are not pushing her oral eating at all - if she doesn't want to eat, we simply give her a feeding and it's all good. I don't care how she's getting her calories, I just make sure she gets them. So, I'm happy to say that things are finally going a little bit smoother and Allie is starting to gain weight again. She sees her GI doctor next week so I'm excited for her weight check. I'm praying she is over 29 pounds and that her height has increased! Since Allie is getting more calories, her energy has increased and she is less crabby too. She just seems like a happier little girl! Chloe speeding up Allie's feeding - apparently the medical pole didn't life the gravity bag high enough. Crazy kids!